Mobile phone radiation gives Gro Harlem Brundtland headaches. WHO Director-General Gro Harlem Brundtland (62), gets headaches from talking on a mobile phone. That is not enough: People in her proximity must turn their phones off in order to prevent discomfort. "It's not the sound, but the waves I react on. My hypersensitivity has gone so far that I even react on mobiles closer to me than about four metres," Gro explains. When we sit with her in her office at "Helsetilsynet" in Oslo she asks if there is an active mobile phone in the room. She finds that she has developed a slight headache. The cellular phone of the photographer was turned on but without sound in the pocket of his jacket. "In the beginning I felt a local warmth around my ear. But the agony got worse, and turned into a strong discomfort and headaches every time I used a mobile phone," Gro says. She thought she could escape the pain by shorter calls, but it didn't help. And in order not to be thought to be hysterical - that someone should believe that this was just something I imagined - I have made several tests: People have been in my office with their mobile hidden in their pocket or bag. Without knowing if it was on or off, we have tested my reactions. I have always reacted when the phone has been on - never when it's off. So there is no doubt." The headache she gets from mobile radiation abates about half an hour to an hour after the radiation exposure stops. Wireless phones, becoming more and more common in homes are said to radiate stronger than mobile phones [due to the lack of low power modes of DECT]. Gro cannot stand such [phones] either. "I get an instant reaction if I touch such a phone". Do you advise against using a mobile phone? - "We do not have scientific evidence to go out with a clear warning. It is not established that the radiation for instance can result in brain cancer. WHO has a big study going on and in 2-3 years from now, we will have better answers to all these questions. But I understand the scientists who warn. I think we have reason to be cautious, and not use the [mobile] phone more than necessary. And the younger you are, the more reason to take this seriously. 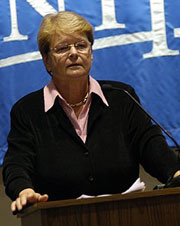 I think you should follow the precautionary principle", Gro Harlem Brundtland says. Previously scientists and physicians have ignored hypersensitivity to electricity. The Norwegian Association for Electro-sensitive felt the resistance to be so strong they closed down their work [they have since started again]. "But I am convinced this has to be taken seriously. Some people develop sensitivity to electricity and radiation from equipment such as mobile phones or PCs. If this sensitivity can lead to adverse health-effects as cancer or other diseases, we do not know yet. But I think we should follow the precautionary principle, especially with regard to our children."